EUR is acting stronger against USD since dollar has been under pressure due to the poor economic data and political developments. 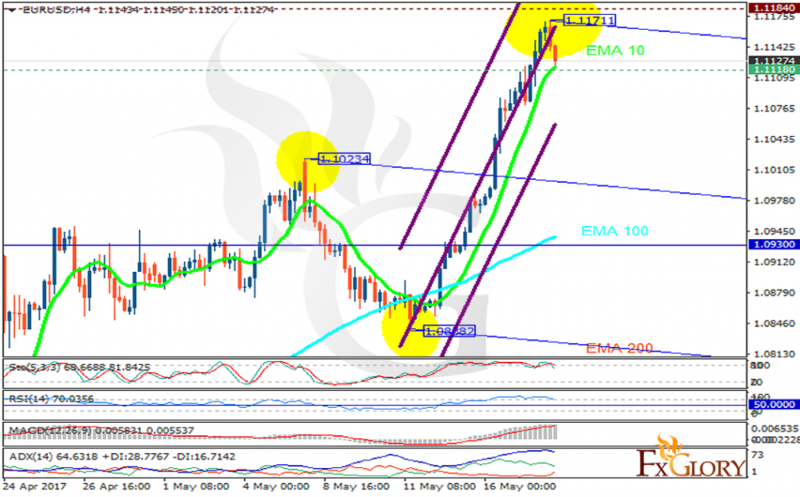 The support rests at 1.11180 with resistance at 1.11840 which both lines are above the weekly pivot point at 1.09300. The EMA of 10 is moving with bullish bias along the ascendant channel and it is above the EMA of 100 and the EMA of 200. The RSI is moving in overbought area, the Stochastic is showing downward momentum and the MACD indicator is in positive territory. The ADX is showing buy signals. EURUSD has started its pullback after reaching 1.11711, in terms of the price decline, sellers can target 1.1050 otherwise, the strong EUR will push the price up targeting 1.14.